It’s been a good one and I’m sure I speak for everybody when I say we’re all sad to see it go, but the 2012 NFL season has provided us with exciting finishes, triumphant record-breaking performances, comebacks, winning streaks, losing streaks and of course, replacement officials. Disappointments, pleasant surprises, rookies leading their teams to the playoffs and unspeakable tragedy have all left their marks on the past 17 weeks as well. Here are 32 of the biggest stories – one about each team – from the 2012 regular season of NFL football. Flew into a wall: Cardinals QB Ryan Lindley watches as Janoris Jenkins (left) scoots into the endzone, returning another Arizona pass for a touchdown. Atlanta Falcons (13-3, 1st in NFC South): The Falcons went 13-3 in 2012 and locked up their second straight No. 1 seed in the NFC playoffs, but that’s not really news – at least not until they actually do something in the playoffs. Matt Ryan improved his home record to 33-4 in five NFL seasons, but that wasn’t even the biggest thing, in my opinion. For the sixth consecutive season, Roddy White played in all 16 games (hasn’t missed a game in his eight-year career) and put up what would seem like Pro Bowl worthy numbers. He did not make it, however, but teammate Julio Jones did. White had 13 more catches and 153 more yards than Jones on the season. Interesting. In fact, White has finished out of the top 10 in receiving yards just once in the last six seasons (2009). In the last six seasons, he has ended up ninth, eighth, second, 13th, fourth and eighth in the NFL in receiving. He has gone to just three Pro Bowls, however, including one due to an injury of another player. The biggest story out of Atlanta this season may just be the fact that one of the most productive receivers in the league from year to year was snubbed from the Pro Bowl after once again bringing that consistent level of exceptional play. Should he be mad? Yes. Baltimore Ravens (10-6, 1st in AFC North): It was kind of a tale of two seasons for the AFC North champion Ravens. They began the year 9-2 and were in the driver’s seat in the division as well as in good position in the hunt for a first-round bye. Then came injuries, however. Already without Pro Bowl defensive lineman Terrell Suggs, All-Pro Ray Lewis tore his triceps in Week 6 and was out for the rest of the regular season. In Week 7 against Houston, Suggs would return. Their success in the last few seasons shows the importance of those two players to the team. As if the Lewis wasn’t bad enough, cornerback Lardarius Webb tore his ACL in the same game and he, too, was lost for the year. Lewis is slated to make his return this weekend, but without these three players all on the field in the second half of the year, Baltimore went from a 9-2 team to one with an average 10-6 record. Should they face an early exit in the playoffs, these injuries will have likely given them their death sentence as the up-and-down offense can’t really be counted on. Buffalo Bills (6-10, 4th in AFC East): As one of the most disappointing teams of 2012, the Buffalo Bills were projected by some to be contenders in the AFC East and perhaps even make the playoffs. That illusion was quickly lost, however, after the team began the year with a 3-6 start, including a 48-28 loss to the Jets on Opening Day. They finished 6-10 at the bottom of the division for the fifth straight year. Buffalo has missed the playoffs in 13 consecutive seasons. Of the six teams that they did beat on the year (the Chiefs, Browns, Cardinals, Dolphins, Jaguars and Jets), not one of them had a winning record. In fact, they had a combined record of 27-69. The defense, which was supposed to be solid with the addition of Mario Williams and Marcell Dareus in his second year, gave up 45-plus points four times on the season as the Bills finished 31st in the league in rush yards against, allowing 145.8 per game. C.J. Spiller did have a solid season as he finished eighth in the league with 1,244 rushing yards, but a knee injury to Fred Jackson really ended up hurting the offense, which finished 19th in the league in total yards. Buffalo fired head coach Chan Gailey on Monday. 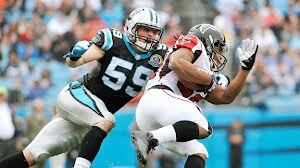 Rookie linebacker Luke Kuechly led the NFL in tackles this season, but the Panthers still finished below .500. Carolina Panthers (7-9, 2nd in NFC South): For the third straight year the Panthers finished under .500, but for the second straight year they had a dynamic rookie on the field with them. As the ninth overall pick in the 2012 draft, linebacker Luke Kuechly not only led the team in tackles, but he led the entire league. He finished the season with 164 while also picking off two passes, recovering three fumbles and deflecting eight passes for the 10th-ranked defense in Carolina. He was not selected to the Pro Bowl, however. Kuechly was so impressive that he may have even slightly overshadowed the sophomore season of Cam Newton, who was just the third quarterback ever to lead his team in rushing yards in a season. With the two of them as their foundation, the future looks bright in Carolina if they can build around them. They could return to the playoffs as early as next year for the first time since 2008. Chicago Bears (10-6, 3rd in NFC North): You can have a good beginning. And you can have a good end. But if you don’t have a good middle, most of the time, success is not on the horizon. The Chicago Bears found this out the hard way in 2012 as they became just the second team since 1990 (out of 53) to miss the playoffs after starting a season 7-1. Unfortunately for them, they lost five of their next six before finishing the season with two straight wins, but by then, it was too late. Jay Cutler‘s injury had a bit to do with it, but ultimately the offense they put out on the field could not get it done in the second half of the year as they averaged just 17.3 points per game in the final eight weeks of the season. Chicago has now missed the playoffs in five of the last six seasons with their only playoff run ending in the NFC Championship Game to the eventual champion Packers two years ago. Head coach Lovie Smith was fired on Monday in a very surprising move that could ultimately result in more bad than good for the team. 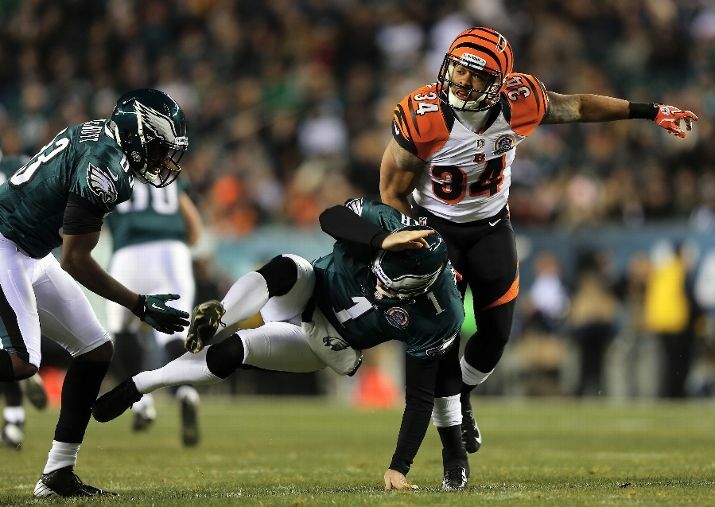 Cincinnati Bengals (10-6, 2nd in AFC North): The Bengals are going to the playoffs for the seconds straight year behind their talented second-year playmakers Andy Dalton and A.J. Green. Green really made a leap in his second year as he finished 10th in the league in receiving yards (1,350), tied for fourth in receiving touchdowns (11) and seventh in receptions (97) while making his first trip to the Pro Bowl. He even had a stretch early in the season in which he caught a touchdown pass in nine consecutive games. His 84.4 yards per game also cracked the top 10 in the league. As the team’s biggest name on the offense, Green continued to put up monster numbers even when drawing the best coverage schemes from opposing defenses. 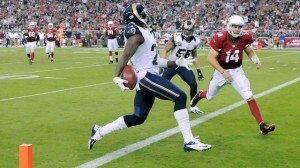 His 164 targets in 2012 were tied for fifth in the league behind five of the best receivers of this generation. Green came up seven catches shy of breaking the record for the most receptions by a player in his first two NFL seasons as Cincy opted to rest most of its starters in their season finale. He has a chance to be the most productive receiver in Ohio since Chad Johnson. Cleveland Browns (5-11, 4th in AFC North): In a backfield that featured two rookie starters in quarterback Brandon Weeden and running back Trent Richardson, the Cleveland Browns were not able to avoid a second straight last place finish in the AFC North, but did win one more game than they did last year (four) if that’s any consolation. Richardson broke Jim Brown‘s franchise record for most rushing yards in a season by a rookie with 950 and also scored 12 total touchdowns. He started every game he appeared in and went over 100 yards three times before being forced to miss the team’s final game with an ankle injury. Weeden also missed the season finale with a shoulder injury. In 15 games at quarterback, he was 297-of-517 passing for 3,385 yards and threw 14 touchdowns. If both of them can come back healthy next year and the Browns can put some other pieces of the puzzle together, they look to be able to contend in the tough AFC North in 2013. Head coach Pat Shurmur and GM Tom Heckert were both fired by the team on Monday. Jaguars QB Chad Henne had a career day on Sunday, throwing for 354 yards, four TD’s and no interceptions in place of Blaine Gabbert. In the last week of football before Thanksgiving, I am thankful for first-time starters, for 59 points, for favorites holding on for their lives in overtime thrillers and for not being a Cardinals fan. I wasn’t as thankful for the Thursday Night game though. The Bills and Dolphins kicked things off in a lackluster matchup of sub-.500 teams on Thursday Night Football with the Bills getting the win, 19-14. They did so without scoring an offensive touchdown for the first time since 2007. Marcus Thigpen became the first Dolphin to ever return a kick and a punt for a touchdown in the same season. The Bills had a punt return TD and a fumble recovery in the same game for the seventh time since 2001 and improved to 6-1 in those games. Only seven points were scored in the 2nd half with Miami getting a 4th quarter touchdown. Sunday was a much better day, which we learned early on with three of the early eight having exciting finishes in overtime. 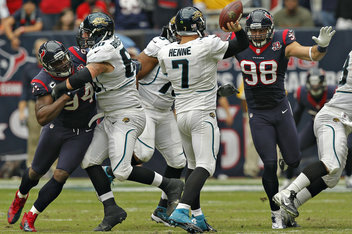 The Texans held on for their lives as the 1-9 Jaguars gave them all they could handle in a crazy 43-37 overtime game. Matt Schaub went off for 527 yards and five touchdowns in the win – both were career highs for him and the 527 passing yards were good for the 2nd-most in a game in NFL history. Andre Johnson caught 14 balls for 273 yards and a 48-yard touchdown to win the game in overtime. Seven of his catches came in the 1st half for 132 yards. His 273 total yards marked the most in a game by a wide receiver since Terrell Owens had 283 in 2000. Houston had been down by 14 in the 4th quarter before rallying to force overtime. Though they did make it quite a game, the Jags have now lost seven in a row after blowing a chance to salvage their season in the spoiler role. Their offense was resurrected after starter Blaine Gabbert went down and backup Chad Henne replaced him. Henne ended up throwing for 354 yards and a career-high four touchdowns – the first time a quarterback has thrown for four touchdowns and no interceptions off the bench since Steve Young did it in 1987. Henne also extended the game with a conversion on 4th & 10 in overtime. He entered the day with four total TD passes in his last five starts. Rookie receiver Justin Blackmon finally had a day worthy of a top-10 draft pick, catching seven balls for 236 yards and a touchdown. His highest yards total coming into the day was 67. His 81-yard TD catch was also good for the 2nd-longest in Jacksonville history behind Troy Edwards, who caught one from 84 yards out in 2003. With another one on Sunday, Cecil Shorts became the first player this season with four touchdown catches of 35 yards or more. The game was only the second in NFL history to feature two 200-yard receivers. Should the Jags have been able to upset the Texans, it would have been the first time since 1985 that a team with a record of 1-8 or worse had beaten a team with a record of 8-1 or better. Wow, that was a lot. And that’s only just the first game. 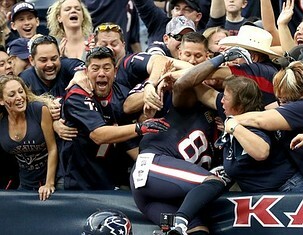 Andre Johnson caught the winning touchdown in overtime and then jumped into the crowd following Houston’s thrilling 43-37 win. In Carolina, the Bucs came back from 21-10 down in the 2nd half to beat the Panthers 27-21 in overtime on a Josh Freeman touchdown pass to Dallas Clark. Vincent Jackson caught a touchdown pass and two-point conversion with 12 seconds left to tie the game and send it to overtime. Rookie running back Doug Martin rushed for 138 yards and a TD and recorded his sixth straight game with 100 or more yards from scrimmage. The win was the fifth in the last six games for Tampa Bay and their fourth in a row. In the final overtime game, the Cowboys came back from a 13-0 halftime deficit to defeat the Browns, 23-20 in overtime. A late touchdown pass from Brandon Weeden to Benjamin Watson gave the Cowboys the ball back with too much time on the clock and they kicked a field goal to send it to overtime. Cleveland hasn’t won in Dallas since 1993. The comeback marked just the second time in Cowboys history that they have won a game they trailed by 13 points at the half. In a shocking twist, Tony Romo has not thrown an interception in any of his last three games (2-1). All three overtime losers blew double-digit leads. Buccaneers’ rookie running back, Doug Martin, had a day for the ages on Sunday, rushing for 251 yards and four touchdowns in Tampa Bay’s 42-32 win over the Raiders. In case anyone forgot why we love this game so much, here are a few incredible achievements, outcomes and performances to remind us all. Tampa Bay rookie running back, Doug Martin had perhaps the performance of the year in the Bucs’ 42-32 win over the Raiders on Sunday. Martin ran the ball 25 times for a franchise-record 251 yards and not one, not two, not three, but four touchdowns. He was responsible for 24 out of Tampa Bay’s 42 points and 220 of those yards came in the 2nd half. The 251 yards was good fir the third-most all-time by a rookie behind Demarco Murray and Adrian Peterson. If you don’t know Doug Martin, now you know. Not surprisingly, this performance gave him the top spot in fantasy football leagues this week, as he racked up 51, yes 51, points in standard ESPN leagues. He became just the third Tampa running back to ever rush for 200 yards in a game. He also became the first Buc to rush for 130 yards in consecutive games. More importantly, the Bucs won just their fourth ever game in the state of California. Wow. Talk about Andrew Luck or RG3 being offensive Rookie of the Year may just have to be put on hold as Martin has combined for 386 yards and five touchdowns in the past two weeks. He has a total of 794 yards on the year, is the top rookie runner in the league after nine weeks and is second overall, trailing only Peterson, who incidentally had a huge day himself on Sunday, running for 182 yards and two scores on just 17 carries. Chicago’s Brandon Marshall and Detroit’s Mikel Leshoure also had huge days in wins by their respective teams. Marshall caught nine balls for 122 yards and three touchdowns in the Bears‘ 51-20 drubbing of the Titans and Leshoure ran 16 times for 70 yards and three scores of his own as the Lions bested the Jaguars 31-14. It was the first time since 2008 that a Lions player had scored three rushing touchdowns in a game. Matthew Stafford reached 10,000 career passing yards in his 37th career game and became the 2nd-fastest to ever do it behind Kurt Warner, who did it in 36 games. In that Bears win, Brian Urlacher picked off a Matt Hasselbeck pass and returned it 46 yards for a touchdown. This marked the seventh interception return for a touchdown by the Bears D this season, just two shy of the all-time NFL single-season record. The 51 points the Bears scored are their most since they scored 61 against the Packers in 1980. Titans running back, Chris Johnson, scored on an 80-yard run in the 4th quarter. Two weeks ago, Johnson ran for his fourth career score of 80 yards or more, breaking an NFL record. His fifth adds to his own record. The Giants and Steelers played an exciting one in East Rutherford as Pittsburgh, trailing 20-10 entering the 4th quarter, scored the game’s final 14 points to win 24-20. For a change, Ben Roethlisberger, and not Eli Manning, led his team to a 4th quarter comeback. Sorry, I don’t have a stat that says how many 4th quarter leads Manning has blown. Steelers running back, Isaac Redman ran 26 times for 147 yards and a TD as both Rashard Mendenhall and Jonathan Dwyer were out with injuries. With their 35 rushing attempts in the game, Pittsburgh improved to 17-1 under Mike Tomlin when running the ball at least 35 times in a game. Due to Hurricane Sandy, the Steelers only got to New Jersey on Sunday morning. Out west, maybe they are who we thought they were, as the Cardinals have lost their fifth straight game after a 4-0 start. Without Kevin Kolb, they are forced to start John Skelton, who is 0-4 in four starts since Kolb went down. They fell 31-17 to the Packers at Lambeau Field and still have never won a game there (0-6). Elsewhere, the aforementioned Luck, has the Colts over .500. They beat the Dolphins, who had won three straight, 23-20 on Sunday for their third straight win. After reaching the 4-3 mark last week, Indy is over .500 for the first time since the end of Peyton Manning’s last season in 2010. Luck became the second rookie in NFL history with four 300-yard passing games in his first year. The other? 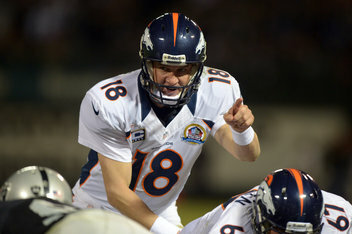 Manning. Luck finished with 433 passing yards on the day – a new rookie record. He also has four 4th quarter or overtime game-winning drives through eight games. The four other rookie QB’s have combined for four among them. And if that wasn’t enough, Luck’s 2,404 passing yards through his first eight games are the most ever by a rookie. Cowboys tight end, Jason Witten tied and broke the team’s all-time receptions record in Sunday night’s loss to the undefeated Falcons as he caught seven balls for 51 yards to bring his career total to 754. He passed Michael Irvin, who was the Cowboys’ leader with 751, for the honor. The Falcons did get the win and improved to 8-0 as the last undefeated team left in the league. Six of the last 14 teams to open a season 8-0 have won the Super Bowl. Matt Ryan improved to 30-4 in his career at home, the best home win percentage (.882) by a quarterback since the merger. Tony Gonzalez became just the second player ever to register 15 50-reception seasons. The other is Jerry Rice. The Panthers finally got their second win of the season as Cam Newton’s squad got the best of Robert Griffin’s, 21-13. Griffin did outperform Newton both in the air and on the ground, however as he and running back, Alfred Morris, became the first pair of rookie teammates to each rush for 500 yards in a season since 1976 and it is the first time ever that this has happened with one of the rushers being a quarterback. Interestingly, the Redskins have not won their last game before Election Day since 1992. The Bills fell 21-9 to the Texans as defensive tackle, Mario Williams, made his return to Houston. He led Buffalo with seven tackles (two for a loss) and recorded one of their two sacks. For the first time in five weeks, the Bills allowed less than 175 rushing yards as they only surrendered 118. The week started off with the Chargers scoring 21 4th quarter points to beat the Chiefs 31-13 in a battle of struggling AFC West teams. Kansas City has lost five in a row and still has not led at any point in their eight games this season (1-7). This is the first time since 1929 that has happened, according to Elias. San Diego had lost three in a row after beating the Chiefs 37-20 in Week 4. Antonio Gates caught his 79th career touchdown, leaving him two behind the Chargers all-time record of 81 set by Lance Alworth. Though they only gave up a single touchdown to San Diego, the Chiefs have now been outscored 61-6 in the 1st quarter this season. Philip Rivers threw his first red-zone interception of the year, but also set a Chargers record by completing 90% of his passes (18-20). The Broncos beat the Bengals 31-23 and improved to 5-3 atop the AFC West. The Bengals fell to 3-5. Eric Decker caught eight balls for 99 yards and two touchdowns. He now has a TD catch in five straight games, one shy of the franchise record. Trindon Holliday returned a kickoff 105 yards for a touchdown and claimed the longest touchdown in Broncos history. Saints quarterback, Drew Brees, threw a touchdown pass in his 51st straight game on Monday night against the Eagles. Brees extended his own record with the throw. 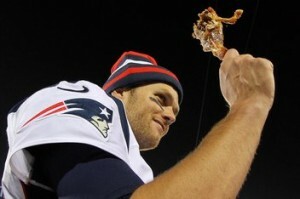 Patriots quarterback, Tom Brady, had a bye in Week 9. The pass went to Marques Colston and it was the 54th time those two have hooked up for a score, tied for the 11th most in NFL history. Patrick Robinson picked off a Michael Vick pass in the red-zone and returned in 99 yards to give the Saints a 7-0 lead in the 1st quarter. The Eagles have scored a grand total of seven points in the 1st quarter this season after being shut out on Monday night. After a lackluster previous three games, however, LeSean McCoy broke out for 119 yards, but just 17 of those came in the 2nd half. New Orleans has now won eight in a row on Monday night, the second longest streak all-time and the longest active. This ties the Eagles’ longest losing streak under head coach, Andy Reid, and the first time that all four NFC East teams lost in the same week since Week 13 in 2011. Vick was sacked seven times for 46 yards and took many more hits as he tried to scramble to make something happen. The Saints have won 12 straight games in the month of November. Some information taken from ESPN Stats & Info. Follow me on Twitter @RealAndyLarmand.